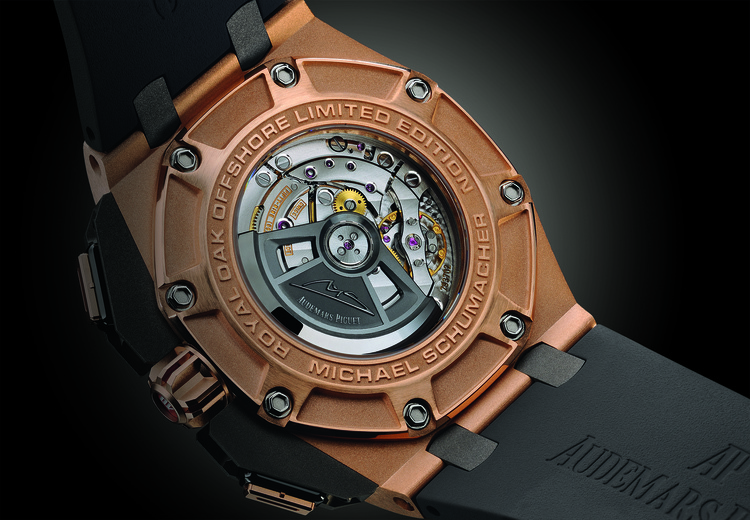 After two years of being an official brand ambassador for Audemars Piguet, Michael Schumacher has his own limited edition watch, a watch he was instrumental in designing, no less. 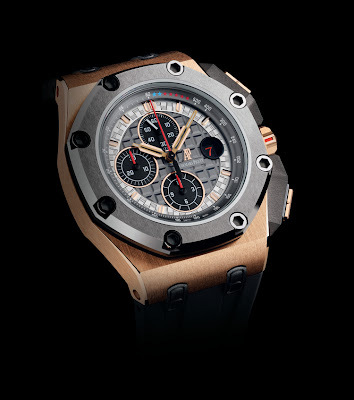 The Audemars Piguet Royal Oak Offshore Michael Schumacher Limited Edition. Not the most clever of names, but then they can’t all be Millenary Astrologias. 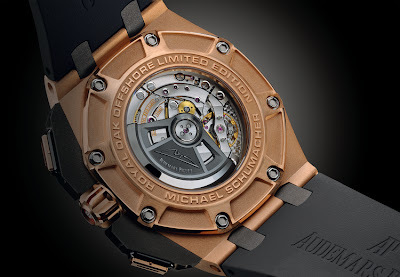 The ROO Michael Schumacher Limited Edition is a 44 mm Offshore chronograph that has received Schumy’s personal touch and a distinctly automotive style. 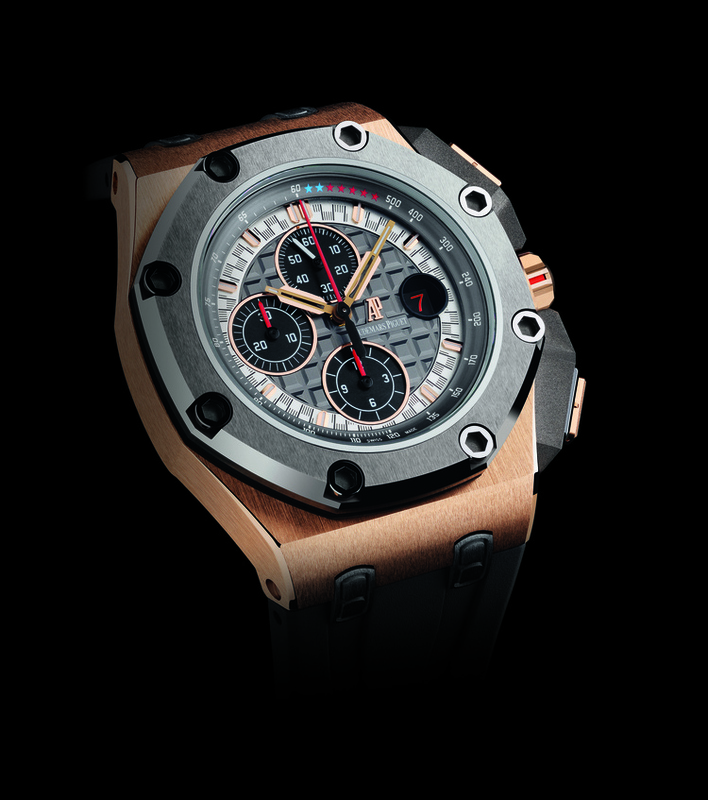 Appearance wise, the Royal Oak Offshore Michael Schumacher looks to be a bit of an offshoot of the Royal Oak Offshore Grand Prix, which makes sense. 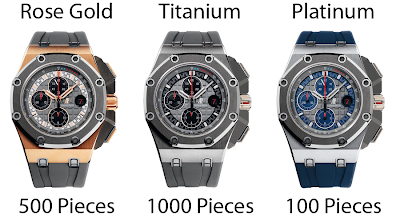 The Royal Oak Offshore Michael Schumacher comes in three case material choices, titanium with a black rubber strap (at a production of 1000 pieces), rose gold with a black rubber strap (at a production of 500 pieces) and platinum with a blue rubber strap (at a production of 100 pieces). 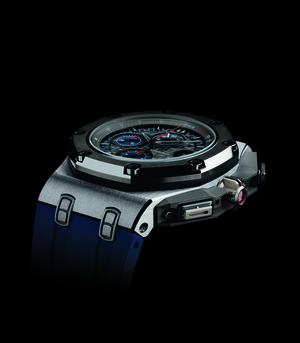 Each case material gets a CeraMet bezel affixed with auto mechanics-inspired nuts and an anthracite Mega Tapisserie dial with an outer ring color coded in checkered flag style to each case and strap combo. 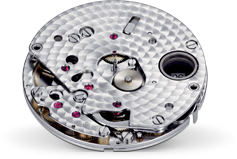 The dial also features seven stars between twelve and one o’clock on the tachymeter scale, Schumacher’s two Formula One championships with Bennetton and five with Ferrari. Schumacher has more championships than any other driver in Formula One history. If that’s not a reason to get your own AP, I don’t know what is. 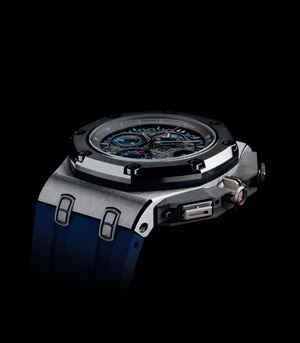 If you take a look at the hands of the Royal Oak Offshore Michael Schumacher, you’ll notice two things. 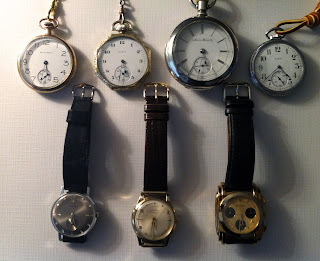 First, they are unique to any Audemars Piguet watch. Secondly, they look vaguely like the overall shape of the carbon fiber monocoque of a Formula One car and are made of glow-in-the-dark material & faceted gold. I really like that feature. 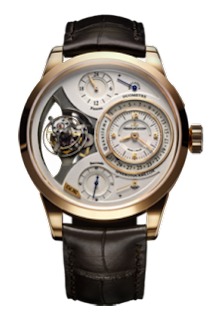 Not often a limited edition watch’s hands play such a cool role in the overall design. 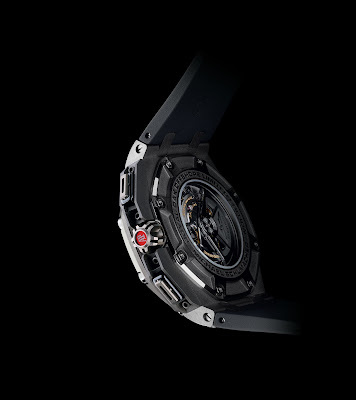 The studs holding the straps to the watch are supposed to look like NACA airducts from F1 cars and the Ferrari F40, but that’s pushing it a bit. 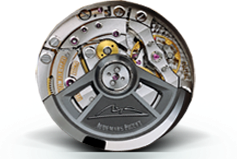 The watch’s back displays the Audemars Piguet calibre 3126/3840 59 jewel chronograph movement through a sapphire crystal mounted into a vaguely car wheel-like case back. Again the NACA ducts are supposed to make an appearance as the rotor cut-outs. Again, that’s seems a bit of a stretch. I do like the gear-looking crown, though. 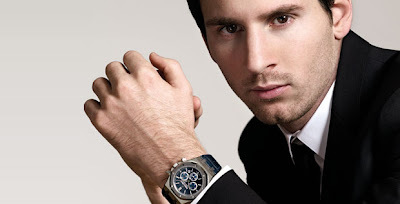 As with the Audemars Piguet Royal Oak Leo Messi Limited Edition, the Audemars Piguet Royal Oak Offshore Michael Schumacher is limited. 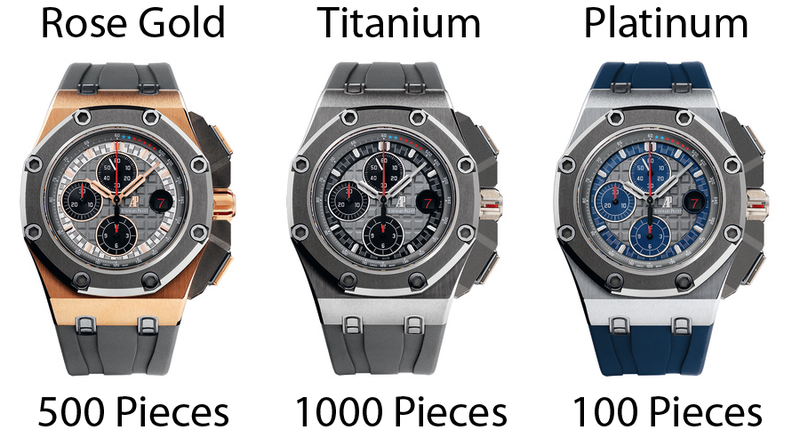 One thousand will be made in titanium at $42,500, 500 in rose gold at $75,000 and 100 in platinum at $110,000.